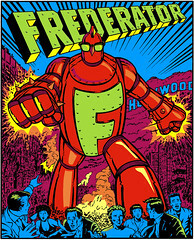 The Frederator Studios Blog: The hits just keep on coming. Postcards, Series 5. The hits just keep on coming. Postcards, Series 5. Frederator launched the shorts from Oh Yeah! Cartoons in 1998. In the first season alone we had Larry Huber's and Bill Burnett's ChalkZone, and Butch Hartman's The Fairly Oddparents. (And, not incidentially, the first film from Bob Boyle, who went on to be the FOP art director, and creator of Wubby, Widget, & Walden). Second season, Rob Renzetti's My Neighbor was a Teenage Robot, which, of course led to the series My Life as as Teenage Robot. So our latest round of limited edition postcards remind me of how much everyone has accomplished. I see in last week's New York Times that FOP is in the top 15 of cable programming four times (more than any other show of any kind); Teenage Robot is producing its third season (a total of 40 episodes); and, ChalkZone is stripping daily on Nickelodeon. (Not to mention the beginning of production of Wubby, Widget & Walden). I'm incredibly proud we're associated with such amazing talent. Great site and great idea. I wanted to know if you had filled any CC4 slots. Also how many storyboards (roughly) would a 7 minute script be? Thanks for the compliment JG. We have not selected any of the 4th season slots yet, but we'll probably be announcing the first ones in the next month or so. A typical script is about 7 pages long (longer if it's fast paced like The Fairly Oddparents, or the Simpsons). Our boards are what are usually called "pitch boards." That is, they only hit the high points of story and expression, and as such, are significantly shorter than a production board. Typical our pitches run about 20 pages of 3 panels each (like in the last entry "Big Baby Bunion"), or about 60 panels. If you've got further questions, feel free to contact our development team at hey@frederator.kz.